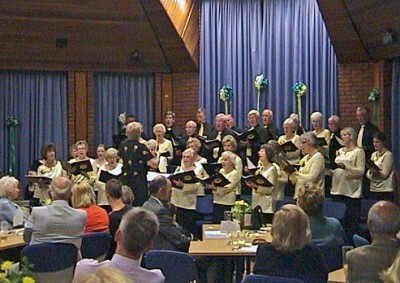 The Primrose Choir celebrated its tenth anniversary in April. Its inspiration and founding force was Kay Hadley, the Musical Director, who gathered together a small group of enthusiastic singers in April 2000. From the original few it has grown over the years to nearly forty men and women. The Choir’s aim is to raise funds for the Primrose Hospice, which serves the populations of Bromsgrove and Redditch and the outlying districts. Choir members are not members of staff, though some are volunteers there, but all are keen supporters of the wonderful work done by the Hospice and give their time freely. They count themselves lucky to have found that they can indulge themselves in an exhilarating pastime and at the same time support their favourite charity. The Choir performs over the whole of the Hospice’s catchment area and sometimes even further afield. In their ten years they have raised thousands of pounds for the Hospice. To do this the Choir performs privately for any organisations or individuals who require entertainment for a special function. The Choir’s repertoire is very varied with an emphasis on light music. It also contains more serious pieces and programmes can be tailored to suit all occasions. Very special occasions for the Choir are weddings, which they love to sing for, though in many ways they can be quite emotional. The Choir has had the pleasure of singing for weddings at such wonderful places as the Church at Coughton Court and the chapel at Grafton Manor as well as more local churches. They also give public concerts – the Summertime Concert in Redditch, the Primrose Proms Concert in Bromsgrove and the Christmas Concert, also in Redditch. These very popular performances are advertised in the local press, the Hospice’s website and around both Bromsgrove and Redditch. The next dates to look out for are the Summertime Concert on Friday June 11 at Redditch Town Hall, the Primrose Proms Concert on Friday October 15 at the Spadesbourne Suite in Bromsgrove and the Christmas Concert at the Rocklands Social Club, Redditch, on Friday December 10. Another way in which the Choir supports the Hospice is by singing at the memorial services arranged for those who have lost dear ones, including the special pre-Christmas celebrations of the Lights of Love in Bromsgrove and the Tree of Light in Redditch. They also have an arrangement with local funeral directors to sing at funerals when requested, which can be a great help to bereaved people at a distressing time. New members are warmly welcomed. The Choir has soprano and alto sections and are proud of their tenor and bass sections but, as always, the men would be glad of some more to swell their numbers. No audition or previous singing experience is required. All that is expected is that members should enjoy singing and want to give pleasure to others. The Choir practices on Wednesday evenings at the Primrose Hospice in St Godwalds Road, Bromsgrove, from 8-10pm. Musical Director Kay Hadley would be delighted to hear from anyone interested in joining the Choir or booking a concert. Her contact number is 01527 546158.